Below are some commonly requested styling changes that aren't currently included in the visual form styler settings or in the field options. You may add custom CSS in your Formidable → Styles → Custom CSS. 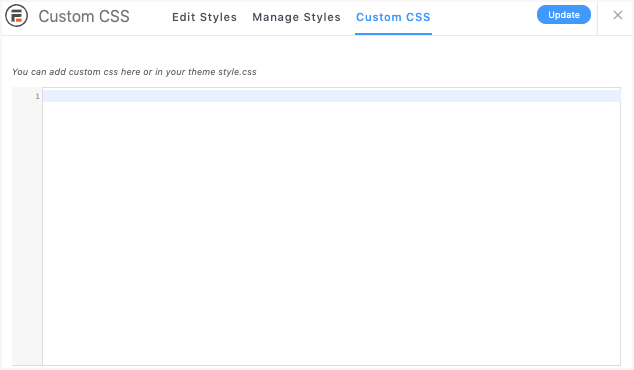 Alternatively, most themes include a custom.css file or a location in the admin section to add Custom CSS. Each form has a unique styling ID that allows you to style one form separately from all other forms on your site. This unique ID looks like: #frm_form_25_container where 25 is the ID of your form. As always, remember to replace the 25 in our examples with the ID of your form. If you would like to replace the submit button on your forms, first go into Formidable → Styles → Buttons and check the box to disable submit button styling. This will provide you with a browser-default button to begin styling. Note: to style forms that were created with a version earlier than 2.03, change button to input in the previous example. Note: you will most likely need to adjust the width and height to the size of the image you are using for your submit button. Additional note: to style forms that were created with a version earlier than 2.03, change button to input in the previous example. This will make it so the Submit button is visible at all times, and will scroll with the user. Note: limiting rows in Repeatable Sections is now a built-in feature, so there's no need to use CSS for this. This example will hide the add button for a Repeatable Section after (5) rows has been added. Replace 376 with the ID of the repeating section field. If you would like to adjust how many rows it takes to trigger this, you can increase or decrease how many times .frm_repeat_sec is added. Note: this example only works with Repeatable Sections that have default formatting, not inline or grid formatting. Sometimes if you have a lot of rows in a repeatable section, it can be hard to decipher one from the other. The following CSS will alternate the color of each row added in a repeatable section. Just change 3424 to the Field ID of your Repeatable Section. You can also change the hex codes to a color of your choice. With inline or grid formatting, you can add this CSS to prevent the div from collapsing and allow the background colors to show. This example will allow you to increase the height of a progress bar in a multi-page form. Change 53 to the ID of your Form, and change 50 to the desired progress bar height, as needed. This example will allow you to style the background color of the active page in the pagination of a View. This example will allow you to enlarge the size of check and radio buttons in your forms. Note: There does appear to be a slight conflict with this working in Safari. The following example allows you to hide the form validation error message box that shows up at the top of the page, but still allows for validation to pass. This means that the field that didn't pass validation will show the error underneath it. Change 28 to the form ID for your form. This example allows your to hide the form validation error text that appears directly beneath the field. Change 123 to the field ID that you want to hide the error for. This example will allow you to display the label position below the field input box. You can add a class (e.g. frm_bottom_labels) to the section fields that include fields where you want to reverse the labels. To reverse all labels in the form, add the class to the form. Optional: Since the label will be close to the input box, you can have a bit of separation between them by adding some margin. Change 5px to the amount you would like to use.